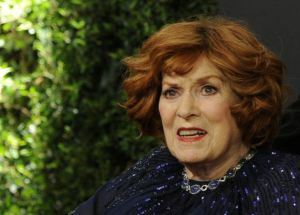 After more than 6o films in eight decades—and thousands of unforgettable moments—actress Maureen O’Hara finally received her Honorary Academy Award last night in Hollywood. The 94-year-old actress was introduced by Liam Neeson and Clint Eastwood, who both admitted they’d been a bit in love with the Irish beauty since boyhood. “I’ll never forget the moment… I was 12 years old at home, watching television on a rainy Sunday afternoon, and they were showing John Ford’s The Quiet Man,” recalled Neeson, clearly speaking from the heart. “The first time the Duke’s Sean Thornton saw her in that film was also the first moment I had laid eyes on her. His character had never seen beauty like that, and neither had I. What a wonderful career life. I hope her private life was a good one and that she enjoyed her waning years, surrounded by family and good friends. I enjoyed her many movies amd appeearances and thank her for portraying strong women. Rest in Peace.